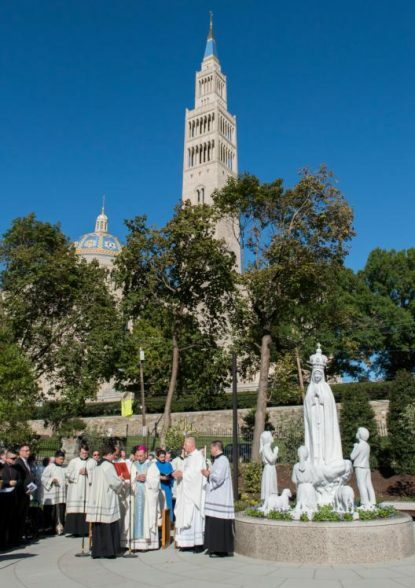 WASHINGTON (CNS) — Our Lady of Fatima’s message about prayer, conversion and peace that she imparted to three shepherd children in a field in Portugal “is as important now as it has ever been since” she appeared a century ago, a Connecticut bishop told Massgoers Sept. 23 in Washington. The bishop was the main celebrant of the Mass, which drew a capacity crowd to the national shrine’s Upper Church. After Mass ended, Bishop Caggiano led a procession of concelebrants, deacons, altar servers and the congregation to a new rosary walk and garden near the shrine. As they walked, people recited aloud the joyful mysteries of the rosary. The paved walkway, symbolic of the thread connecting a rosary’s beads, circles through and around the garden, taking visitors past groupings of colorful mosaics that illustrate the 20 mysteries of the rosary. Bishop Caggiano walked to the Fatima statue, then around the path, blessing the new garden as he went. He ended up back at the statue and led the crowd in prayer. At the beginning of Mass, Msgr. Walter Rossi, rector of the national shrine, welcomed the congregation, noting the 2,000 pilgrims from the Diocese of Bridgeport in attendance, along with pilgrims from the Philippines and China, the New York area and the Washington region. Bridgeport’s diocesan youth choir sang for the Mass, which was broadcast live by the Eternal Word Television Network, CatholicTV of Boston and New Evangelization Television of the Diocese of Brooklyn, New York. Msgr. Rossi said it was the first pilgrimage from Bridgeport in about 15 years, adding that shrine officials were thrilled to see so many young people at “Mary’s shrine.” “I often say that our young people are the hope of the world and the church and they are the hope of Mary’s shrine,” the priest added. Opening his homily, Bishop Caggiano asked, “My friends, what are you looking for? What is it that you seek?” This “may sound like a strange question to ask on an occasion such as this and yet it seems to me that is the question that roots each of our lives,” he said. “It is the reason that we have come here to this sacred place, and on this day of pilgrimage and prayer (it) affords us an opportunity to answer it again in your heart and mine in the mind of Christ,” he said. About 1,500 pilgrims from Bridgeport boarded buses for the one-day trip to Washington; the other 500 came on their own. Pilgrims talked about the experience in tweets and in Facebook postings. “We’ve made it to the Basilica of the National Shrine of the Immaculate Conception! Positively joyful atmosphere here!” one person said in a Facebook post. “It was such a beautiful and spiritual day for me and my family. I was honored to serve in the Knights honor guard for the Mass,” said George Ribellino.